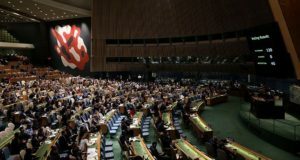 The Unites States Thursday failed to garner decisive support at the UN to condemn Gaza ruler Hamas for firing rockets on Israel after a draft resolution championed by the US diplomat missed the target of two-thirds of the General assembly members. 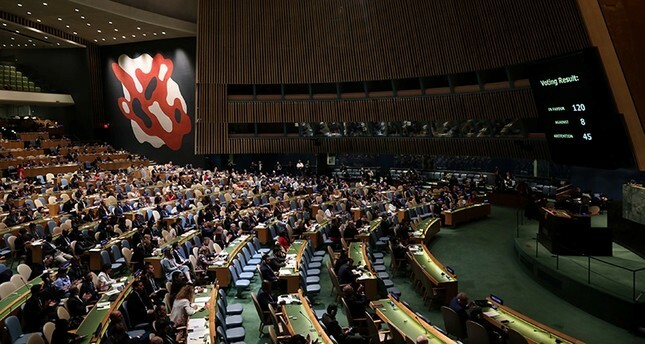 The UN-sponsored draft resolution received the backing of 83 countries, including the European Union members, but met the opposition of 57 countries in addition to abstention from 33 other member-states. US diplomat to the UN, Nikki Haley called on the world to support Washington’s hardline on Palestinians mainly on Hamas, which she accused of firing rockets on the Israeli ally. Haley, who is stepping down end of this year, has repeatedly castigated the UN for being biased and anti-Israel. The US diplomat before the vote said the resolution on Hamas would be an opportunity for the UN to “right a historic wrong” by correcting its “awful record” of passing resolutions against Israel. The US and the EU have blacklisted the Islamist movement, which has taken control of Gaza since 2006 and has fought three wars with Israel since 2008. Following the vote, Hamas said the UN rejection was a “slap” to the US administration. “The failure of the American venture at the United Nations represents a slap to the US administration and confirmation of the legitimacy of the resistance,” Hamas spokesman Sami Abu Zahri wrote on Twitter.